I admit I thought I was going to tune-out, but as it turned out, I was actually fervidly drawn into this film. What Maisie Knew has the audacity to follow the perspective of a 6-year old girl (played by newcomer Onata Aprile) and dares to stay there. 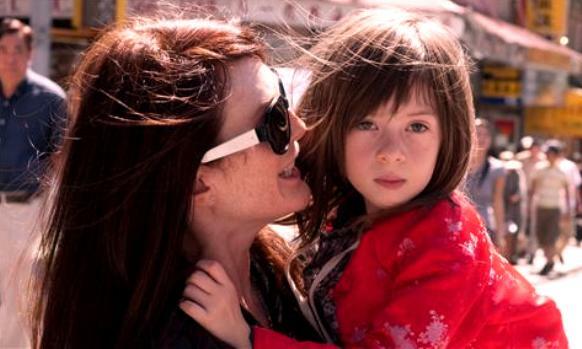 Her parents (Julianne Moore and Steve Coogan, both uncompromisingly self-absorbed) are divorcing and fighting for custody, and thus this becomes a portrait of survival for a little girl who has yet to have the advantage of knowing how the world works. Simply, this joins “Kramer vs. Kramer” and “The Squid and the Whale” as among the three key films about how divorce emotionally damages the children. The parents are rich people, with incalculable money and real estate. Moore is Susanna, an aging rock star staging a comeback tour. Coogan is Beale, an art dealer who customarily flies back and forth from England to home in New York. I shouldn’t have to reassure you these are peerless, cunning performances. But there I go. Moore makes an impossible prima donna credible. Coogan is as ever unrecognized for his brilliance at playing uppity smart asses. Two actors that don’t give a damn about likeability, alas, serving the film for the better. Beale heedlessly marries Maisie’s former nanny (Joanna Vanderham), which feels like an attempt to stab his ex in the back. Susanna likewise marries a bartender (Alexander Skarsgard) on a whim, which feels like a convenience to attain a daily babysitter. The nanny and bartender are surrogate parents that unexpectedly spend the majority of time caring for Maisie. Their guardian arrangements make more sense than Beale’s or Susanna’s. Does corralling Maisie to ride along on a rock tour bus make a lot of parenting sense, for instance? Does a father deliberately not showing up for custody duties and using the excuse “I didn’t know it was my time yet,” make a lot of parenting sense, either? I yearn for movies that push forward into an improbable situation with the confidence to make it persuasive and convincing. Maisie ends up ultimately where it makes the most sense for her to end up. Improbable but true, as well as it amounting to a singular humane solution. Scott McGehee and David Siegel are co-directors that have only made a small handful of movies over 15 years (“The Deep End” is their best). They have taken a downbeat subject, avoided all sappy temptations, and made a film of merit that is gripping, involving, wrenching. Young Aprile acts with an honest heart and demonstrates presence and awareness in every scene. Of course she had to. The whole film is about everything she sees. Based upon the Henry James novel over a century old, but you can’t detect any musk. “What Maisie Knew” is very much a story that fits today. Film Cousins: “Kramer vs. Kramer” (1979); “Irreconcilable Differences” (1984); “Ponette” (1997, France); “The Squid and the Whale” (2005).